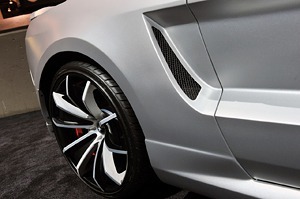 One of the most popular vehicle modifications in the automotive world today is custom wheels and tires. Custom wheels help you stand out from the crowd without spending a lot of money; while custom tires can help you fine tune your performance. Although custom wheels are a matter of taste, custom tires are a matter of function. That is not to say that there are not a lot of cool looking tires out there, but tires are vital to your safety. Many people are tempted to order tires and wheels online but do not realize that some of their vital safety systems may be affected. For example, your rolling diameter needs to be within 3% of factory specifications in order for your anti-lock brakes to work properly. Not to mention, your traction and stability control systems can also be adversely affected. At Mr. Kustom Chicago, we make sure your new tires and wheels fit without rubbing. We’ll check that your engine management computer to see if it needs to be reprogrammed so your speedometer is properly calibrated. It pays to get professional help when deciding on a custom wheels and tires and we can help you get the look you want. Whether you want a single purpose winter or summer performance tire – or something that can handle a wider range of conditions, we have tire options for every taste and price range. From sleek and stylish to tough and aggressive, the available styles, colors and finishes are endless and Mr. Kustom Chicago can help you get the look you want. We carry all major brands and guarantee all our services. Contact us with all your inquiries.